I spent last week — as did an estimated nine million other viewers — watching Ken Burns’ The Roosevelts: An Intimate History on PBS. This whopper delivered big-time. The Franklin and Eleanor episodes were the strongest probably because their personalities are more recent and accessible. Also, there is an abundance of action film from the era. The earlier Theodore Roosevelt segments had to rely upon still photos, rigorously panned in the best Burns tradition. The take-away is that these two presidents, fifth cousins, saw the rural world of our forefathers passing and by the sheer force of personality they reinvented the United States as a modern nation. Tell that to the originalists. 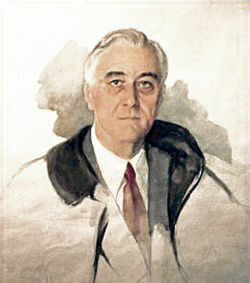 Above is the famous Unfinished Portrait of FDR. This preliminary likeness was sketched by the artist Elizabeth Shoumatoff at Roosevelt’s retreat in Warm Springs in April of 1945. During the sitting, FDR complained of “terrific” pain at the back of his head and had to be carried to bed. He died shortly thereafter. The series is subtitled in Spanish. You might also want to check out the companion book by Geoffrey C. Ward. It contains more material than is found in the documentary. 3:19 PM * watching television after walking 75 blocks home, it feels so distant. i turn from the tv to my computer monitor to not look at it. i’m scolding myself for being desensitized by an hour of television footage, replaying collapse timelessly. it is not like a movie and i scold myself more than that by saying i saw a plane hit the world trade center today and remembering that i was surprised a second plane came out of the bay and that i had instinctively stepped back from the windows, afraid of a shockwave that would break the windows i was looking through. it only happened once, horribly once. it is not surreal my fellow architects and i knew that without fire suppression systems and help, there was no way the structure was going to survive (structural steel melts after being burned for an hour) and knew exactly how it would fail. 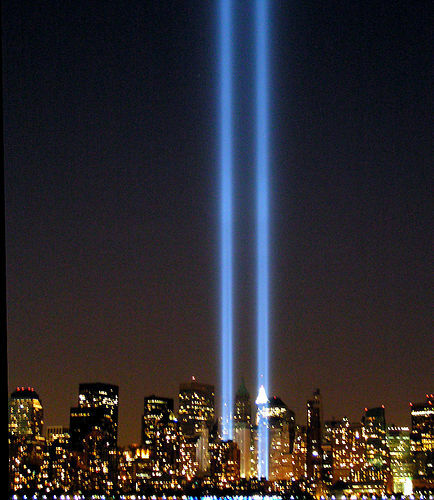 you saw several hundred people falling a hundred storeys. each of them fell only once. Chad Smith is a New York architect, writer, martial artist, and club team rugby player. This 9/11 entry was published originally published on the website www.nycbloggers.com. 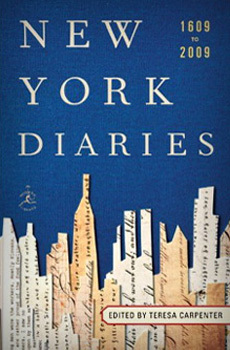 It appears on p. 288 of New York Diaries: 1609 to 2009.